For the past couple of weeks I’ve been wandering through the southernmost reaches of Illinois gathering information for the outdoor guidebooks that I’m currently writing. In addition to charting a handful of road biking routes and dozens of camping destinations, I also was documenting hiking trails for the Backpacker magazine website. I was especially eager to explore the Shawnee National Forest, a huge tract of wilderness at the southern tip of the state, known for its rugged beauty. As it happened, rain fell frequently. Floodwater swallowed up a few of the trails and campgrounds I visited. Two campground access roads were blocked with mud slides. My bicycle survived heavy downpours; my boots were frequently caked with mud. While dodging the worst of the rain, I discovered plenty of scenic spots. 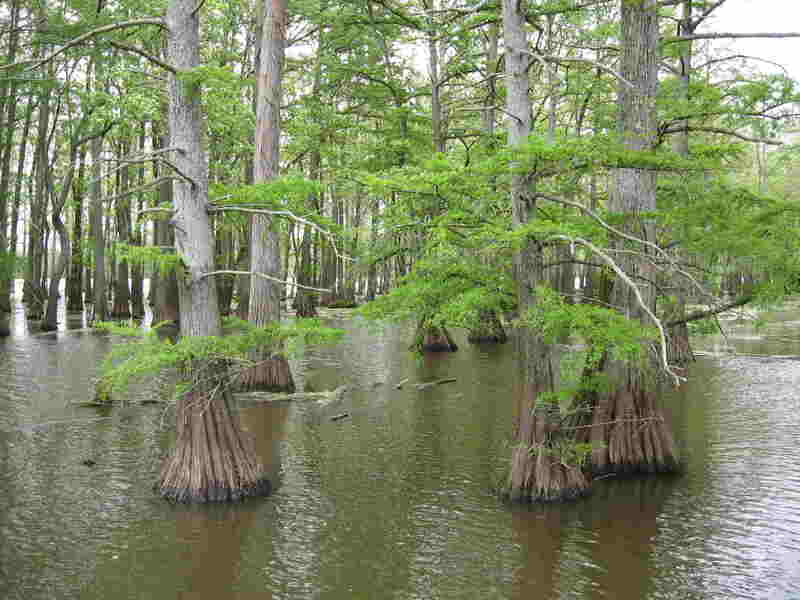 The subtle beauty of the cypress swamp at Horseshoe Lake (pictured here) and the jaw-dropping drama of the rock formations at Garden of the Gods were just a couple of places that left strong impressions on me. In coming weeks, I’ll be sharing highlights from my downstate travels. This entry (Permalink) was posted on Friday, May 23rd, 2008 at and is filed under Biking, Hiking, Illinois. You can follow any responses to this entry through the RSS 2.0 feed. You can leave a response , or trackback from your own site. nice photo. I half expected to see you pictured in this photo standing in a flat bottom swamp boat wearing a hat with side-flaps and holding a double-barrel shotgun. Prairie Fever is powered by	WordPress 3.5.1 and delivered to you in 0.205 seconds using 35 queries.